New York City can finally have a 42nd Street that welcomes pedestrians with space, greenery, and amenities, combined with speedy and efficient river-to-river travel, via a modern, at-grade, low-floor light rail line. 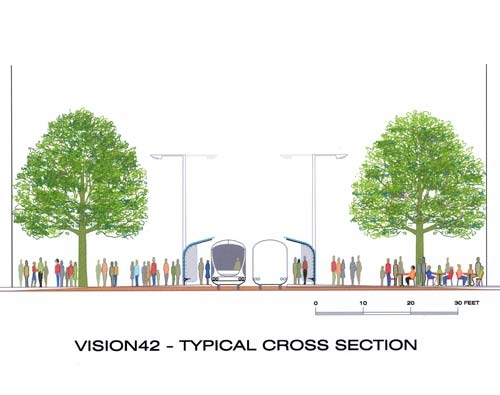 This can be a reality within four short years with the adoption of vision42—an auto-free, light rail boulevard. New York is unique among American cities in its size and extraordinary diversity. It remains a city scaled for pedestrians, while most other urban environments on our continent have been redesigned for cars. The vitality and intensity of New York derive in large part from this very human scale of circulation and activity. Public transportation is used in far greater numbers in New York than in any other American city; some 85 percent of daily commuters to midtown Manhattan arrive there by train, bus, or ferry, and most proceed to their ultimate destination on foot or by local transit. And yet, very little has been done over the past half century to improve our city’s environment for either walking or surface transit. Forty-second Street—where half a million pedestrians come every day, and where pedestrians outnumber motorists by at least 5 to 1—is an excellent place to start! Times Square receives some 165,000 people per day, even before the addition of planned new office towers. 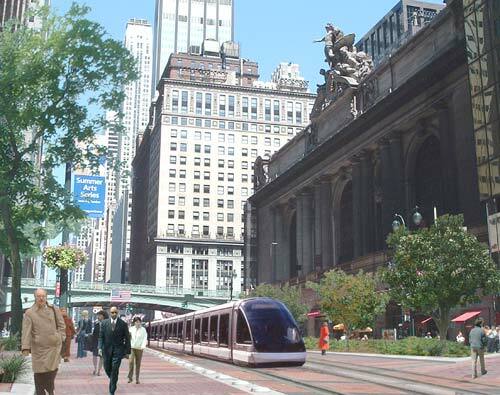 At Grand Central Terminal, an auto-free 42nd Street would greatly facilitate access to the station by pedestrians. Today’s crosstown bus transit in Manhattan is often slower than walking, and the need for better crosstown circulation has long been recognized. A previous plan to re-introduce light rail on 42nd Street was advanced by the 42nd Street Development Corporation and the City’s Department of Transportation, and was approved overwhelmingly in 1994 by the City Council. It called for converting the southern half of the street into a transitway, while retaining westbound traffic. That proposal would have provided an important upgrading of surface transit, but did not address the need to improve the walking environment — and this is becoming an increasingly critical issue because of all the new and newly planned developments along 42nd Street. The sidewalks are becoming increasingly congested with every new development. 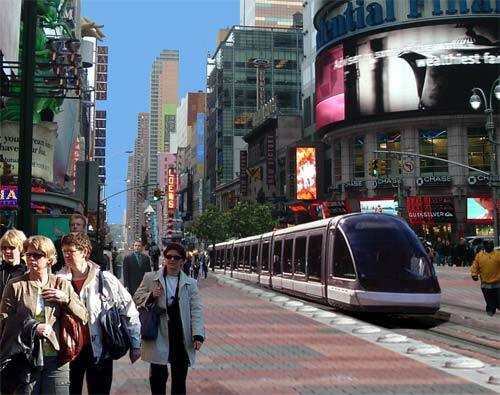 By eliminating traffic in both directions, and incorporating substantial pedestrian amenities into its long-awaited 42nd Street light rail plan, New York City can finally make this transportation improvement a reality. Not only will the absence of cars dramatically upgrade the walking experience, the light rail vehicles will also flow more freely without interference from other forms of traffic. This is a winning combination that, not surprisingly, has become the norm in progressive cities around the world. Pairs of light rail stops would occur at each typical 800-foot avenue, resulting in twelve pairs of stops along the length of 42nd Street, plus two pairs at each of the far eastern and western ends along the rivers, as shown on map d of the initial river-to-river light rail line. Planters could be added as partial safety barriers at appropriate locations — a matter of careful design study. With the traffic diverted to nearby crosstown streets and avenues, 42nd Street’s curbs can be eliminated, reducing tripping hazards and allowing space for outdoor restaurants, cafés, and other pedestrian amenities in front of the shops. The street can be rebuilt with special paving, which can be sloped up about a foot to create station platforms, since the low floors of modern light rail vehicles are only about a foot above grade. Landscaping will be low-lying, in planters, at Times Square, where the visibility of marquees is important.